Louis Vuitton Trunks Conjure Visions of Railway and Steamship Travel | Skinner Inc. Founded in 1858, Louis Vuitton, the then four-year-old Parisian luxury goods maker introduced its first trunk in the gray-toned “Trianon” canvas. To further distinguish themselves against their imitators and competition, the firm subsequently released the striped “Rayée” canvas and checkered “Damier” canvas before finally releasing the iconic “Monogram” canvas in 1892. 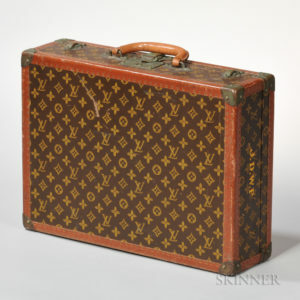 In the age of railway and steamship travel, Louis Vuitton trunks were the epitome of luxury and function. 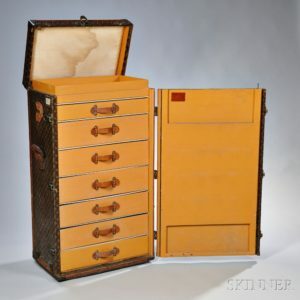 Interior components in the standard steamer trunks both organized and protected the contents from overzealous handling and jostling anticipated with travel. 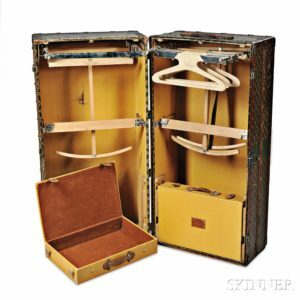 The rarer upright garment trunks included a variety of customizable compartments to accommodate any traveler’s need; from pull-out writing surfaces and hat compartments to hangers and glove boxes. Over the years, we have had the pleasure of offering a multitude of examples, with various arrangements of interior components. The Upright Wardrobe Trunk (at left) opens to an entire row of shallow drawers and the Steamer Trunk (at right) features hanging wardrobe storage on either side as well as removable shoe boxes on each side. Vintage luggage by iconic luxury brands bring to mind the days of travel over sea and rail while providing a wonderful functional purpose and decorative accent. Suitcases, originally made for the British market and train travel were introduced at the turn-of-the-century. The Alzer style is still in the current line. Look for the early hard-sided models that remain functional for 21st-century travel or stack several to form an end-table. Editor’s Note: This post was originally published in October 2015 and has been completely revamped and updated for accuracy and comprehensiveness. This entry was posted in Blog and tagged Louis Vuitton, luggage, luxury goods, Paris, suitcase, trunk by Stephanie Opolski. Bookmark the permalink.